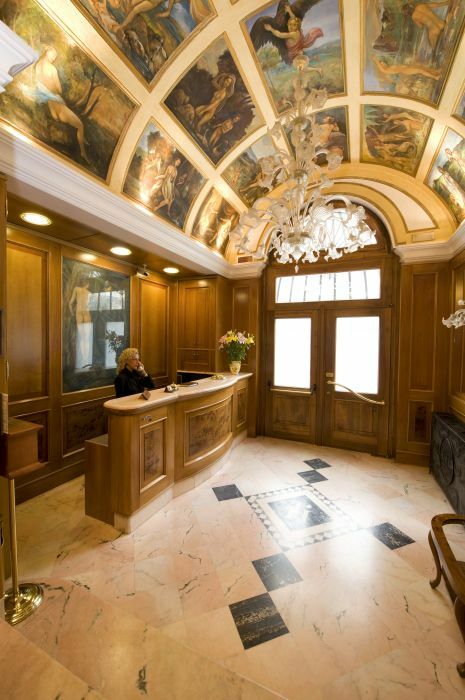 Hotel Joli of Palermo is a 3-star hotel that was completely refurbished in 2003 to showcase the elegant structure dating from the beginning of the 1900s complete with the services and comforts needed either for tourist holidays or for business trips. 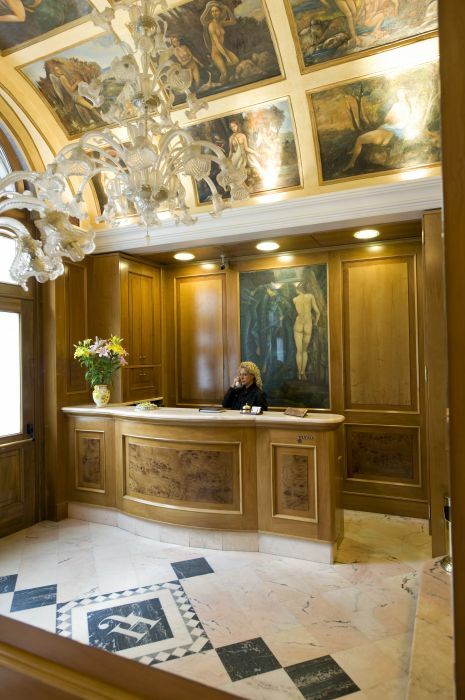 The care and distinction that sets Hotel Joli apart are evident as soon as you arrive at its entrance consisting of an original iron and glass canopy in typical Liberty style; just as elegant are the reception area that holds original paintings depicting mythological themes and the very spacious hall and bar decorated in warm woods and precious marbles. These refinements continue on in the inlaid floors of the reading and TV room and throughout the soft atmosphere of the breakfast room with frescoed ceilings where the continental style breakfast, plentiful of fresh fruit and traditional Sicilian sweets, is served every morning. Hotel Joli boasts a large terrace overlooking the gardens of the beautiful Piazza Ignazio Florio, ideal for Clients that are looking for a rejuvenating rest or a period of study and reflection. Next to the hotel, and available to Guests, there is a private parking lot for an established cost. 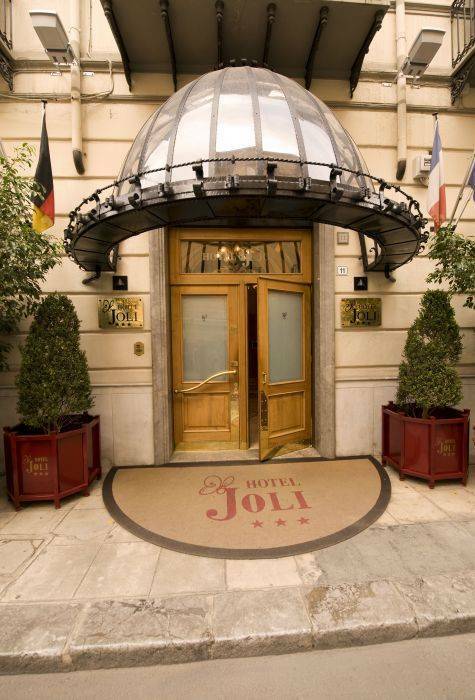 Staff at Hotel Joli will be delighted to welcome you by providing a very personalized and careful service so that you may feel comfortable in a pleasant and family-oriented environment. Hotel Joli, located in the heart of Palermo, is easily accessed from the train station , from the port, the airport and the motorways. Indeed, it is located at the corner of Piazza Ignazio Florio, only a few steps from the city's most important cultural, tourism and commercial points of interest. 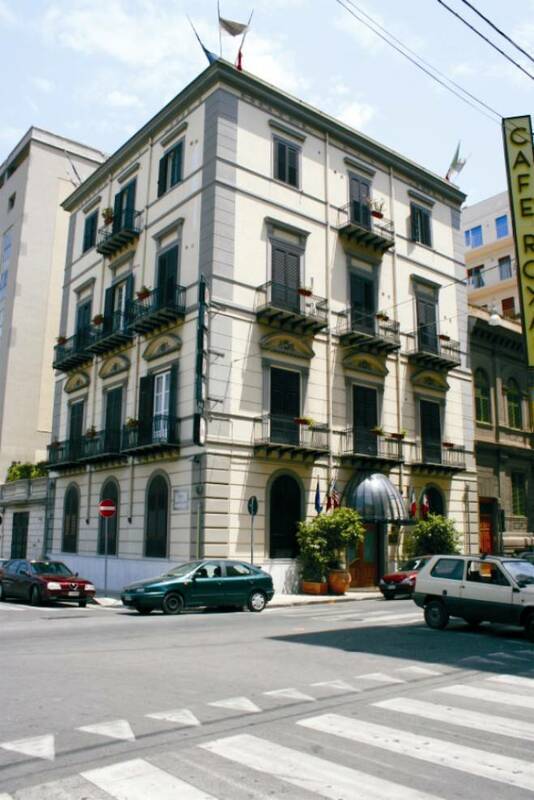 Hotel Joli is found in the middle of Palermo Liberty, where ever since the mid 1800s all the way to the first decades of the 1900s, and thanks to economic and cultural revival, great theatres, public gardens, music stages, kiosks, etc. were built as well as new elegant neighborhoods along Via Libertà and Via Notarbartolo. Each room has a private bathroom, with shower and bathtub, and with hair dryer availability; some of the rooms come with an elegant and pleasant balcony overlooking the Piazza Florio, with a view on Monte Pellegrino. All the rooms come with air conditioning and with individually regulated heating, TV and mini-bar, safety box and direct dial telephone and high speed connection option (ADSL). Exactly 500 meters from the hotel, in Piazza Ruggero Settimo, one can admire the Neoclassical Teatro Politeama Garibaldi, with the grand arch and the spectacular bronze quadriga on the facade. Opened in 1891 it is the second of Palermo, the first one being the Teatro Massimo of Piazza Verdi, at 600 metres from the Hotel. Inaugurated in 1897, a few years after Politeama, it soon became the hub of artistic and mundane Palermo life, making the city one of the most lively European centres for its cultural and commercial endeavors. Take note of the typical liberty kiosks found across the theatre, with the Vicari on the right and on the left Ribaudo. 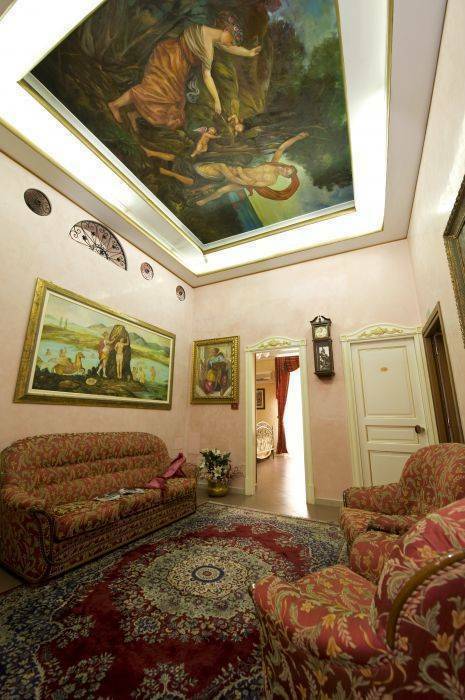 Always close to the Hotel Joli, at 400 meters, is located the very refined Villa Withaker or Villa Malfitano; built in 1889, which to this day is surrounded by a magnificent lush garden. The oldest part of Palermo is on the east side of the city and here you must pay a visit to the many attractions and museums. From Autostrada Catania Palermo take Via Oreto and continue until reaching Stazione Centrale. Then take Via Roma and continue for about 2km, until reaching the cross at "Via Mariano Stabile" or "Via Principe di Granatelli" and turn right. If you take? "Via Mariano Stabile" turn on the first road to your left, on Via Michele Amari where at no. 11 you will find our Hotel. If you turn instead on "Via Principe di Granatelli", the Hotel will suddenly appear. From Autostrada Trapani-Palermo take Viale Regione Siciliana towards the south-east up to the rotonda of Viale Michelangelo, then continue on Viale Leonardo da Vinci. Turn right on Via Migliaccio and then on the left at Via Campolo. Continue on Via Giovanni Battista Lulli and then turn left on Via Malaspina. Turn right on Via Notarbartolo and continue up to the cross at Via della Libert?. Take this road until you reach the cross at Via Emerico Amari (located between two squares: Piazza Politeama and Piazza Castelnuovo). Then turn right and continue until you come to the cross at "Via Principe Di Scordia". Turn right and continue until Piazza Ignazio Florio. The Hotel is located at an opposite corner of the Piazza. To reach the Hotel coming from Palermo's "Falcone Borsellino" Airport you may reserve our pick up service, or you may take a taxi or public transportation. When using the shuttle Bus you must get off at Piazza Politeama: from here continue on foot on Via Emerico Amari and turn as soon as you spot Via Michele Amari. Continue on and within 2 minutes you will have arrived. From Porto di Palermo you will be able to reach the hotel very easily on foot in about 5 minutes: Exit from the main entrance and keep going straight until you reach Via Michele Amari (4th road on the left), where our hotel can be found at no. 11. If you are coming by car, take the same route but turn on "Via Principe Di Scordia" (3rd road on the left) and continue up to "Piazza Ignazio Florio". The Hotel is located exactly at an opposite corner of the Piazza.